Have you used Pinterest with your class yet? While it’s true that many teachers are already using Pinterest to “file away” lessons we want to try in the future, how many of us have thought of its application in the classroom? Brian gives an example of using it with a Dinosaur unit. Ahead of time set up a Pinterest account for your class that is separate from your personal account. Make the same number of boards as the number of students in your class + 1 for yourself to use as an example when you are modeling how to do it. Instead of naming the boards with the name of your students, number each board so you don’t have to redo them next year. Assign each student a number, preferably alphabetically. Each board will be a collaborative board, but only you and one student will be collaborating on each board. Although you won’t be pinning to their boards, you need “veto power” to edit inappropriate pins. *Students can pin your skill of the week. -Pin 5 pictures that begin with “ch”. -Pin 5 pictures that are geometric solid shapes. For grading purposes, you can give them a goal such as pinning 5 pictures. Students who pin more than 5 can earn extra credit. To differentiate: Have your “spark plugs” find 3 pictures with “ch” at the beginning of the word and 3 pictures with “ch” at the end of the word. One of the glitches to setting up a class pinterest project with younger students is facebook or twitter. In order to sign up for pinterest, you have to have a facebook or twitter account. Students under 13 aren’t allowed to have a facebook account. One way around this is for the teacher to set up a class account on facebook and then join Pinterest using that account. A classroom computer could be the designated “Pinterest” center. Students would rotate to the computer to pin the skill of the week to their designated board. 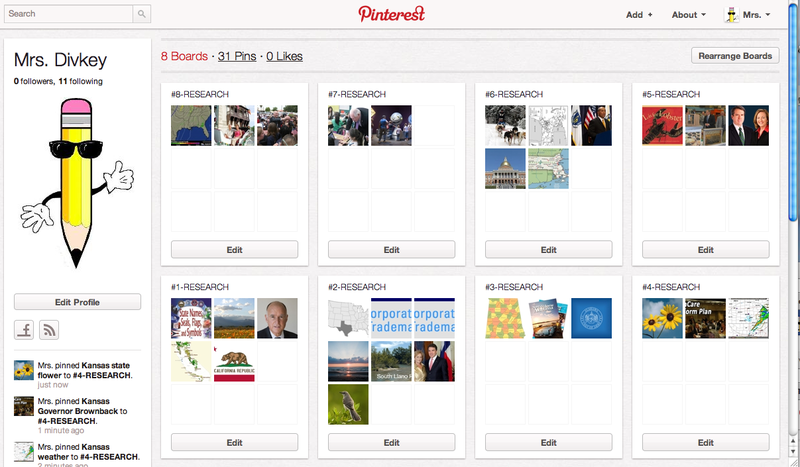 Have you tried using Pinterest in your classroom yet? If so, I’d love to hear how you used it. This is a great post Michelle – you have done an excellent job of coming up with some actual examples of ways that teachers of different grade levels can use Pinterest as an interactive learning tool in the classroom. And I especially like that you set up a prototype of what a classroom board might look like! Please let me know if you end up using Pinterest in one of your classrooms, or if you receive any feedback from any other teachers who have given it a shot… I'd appreciate hearing how it turns out. Thank you Brian. You had the original idea. I will definitely keep you updated on what I find out. I'm hoping other teachers have tried it and will share their ideas. Thanks for letting me share your ideas. I love Pinterest. Is it completely safe for children or would I have to monitor it closely? I wish there was a way to filter the students searches. I worry my 4th graders will stumble on to something and then I will be accountable. I do use Edmodo and its pretty cool and 100% safe. I think I will use it for vocabulary…thanks for a great idea! I absolutely love this idea! The only drawback is that I think a teacher would need to closely monitor what the students are searching because they could inadvertently stumble across inappropriate pictures. And some schools don't allow Pinterest access at school. 🙁 However, this is definitely something I am going to share with other educators! The opportunities could be endless here!